In Sept. 2016, Rivada Networks, Herndon, Virg., signed a no-cost, no-obligation contract with the state of New Hampshire to develop an alternative radio access network plan for the state instead of using AT&T and FirstNet. Rivada delivered a draft of that plan in March 2017, ahead of schedule. Today, U.S. Cellular agreed to assist Rivada in the development of that network, should the governor choose to opt-out of FirstNet’s deployment plan for New Hampshire. Under the agreement, U.S. Cellular will provide its more than 30 years of experience in managing and constructing wireless networks to assist Rivada in the deployment of a state-of-the-art network for New Hampshire’s first responders. Excess capacity on that network will be offered for commercial use to support wireless users throughout the state of New Hampshire, including U.S. Cellular customers. “This effort will ensure the best of both worlds, a first-class network public responders can rely on and a commercial network to help augment the insatiable demand for data by New Hampshire consumers,” Meyers said. 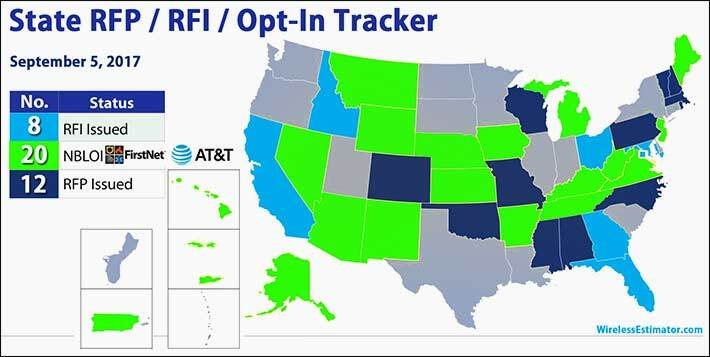 On Sept. 1, FirstNet announced that it had over a third of the nation’s states opting into the FirstNet/AT&T network, although many of them are the country’s least populated states. Early last month, Michigan became the first state to opt-in to FirstNet after issuing a request for proposal. On Aug. 17, Verizon Wireless announced that it is going to build and operate its own private network core to serve first responders, jumping into the ring with AT&T who has the contract to build out the opt-in FirstNet network.